The Focke-Wulf Ta 154 Moskito was a fast night fighter designed by Kurt Tank and produced by Focke-Wulf late in World War II. 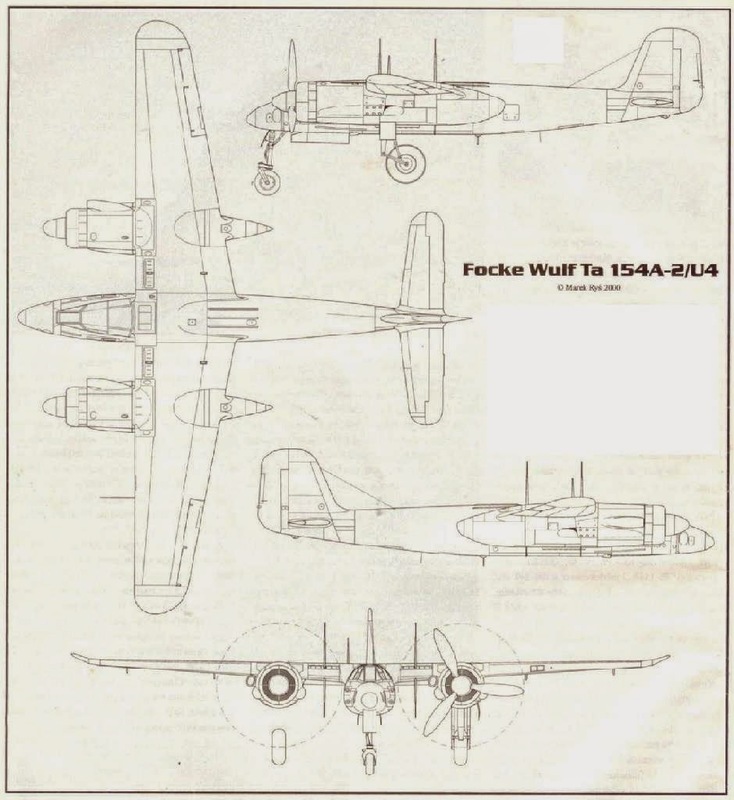 A competitor to the Heinkel He 219, the Focke- Wulf Ta 154 was intended as the Luftwaffe’s response to the British De Havilland Mosquito, and came near to becoming a major combat Luftwaffe airplane. The first prototype, V1, fitted with two Jumo 211F engines, flew on July 1, 1943. The first armed version of the Ta 154 with Lichtenstein radar was the V3, which also was the first to fit the Jumo 211R engines. By June 1944, the Jumo 213 engine was finally arriving in some numbers, and a small batch of Ta 154A-1 craft were completed with these engines. The Ta 154 had a crew of two, a length of 12.55 m (40 ft 3 in), a wing-span of 16.30 m (52 ft 5 in), a height of 3.60 m (11 ft 4 in), a wing area of 31.40 square m (333.68 square ft), and an empty weight of 6,600 kg (14,550 lbs). It had a maximum speed of 615 km/h (404 mph), a range of 1,400 km (872 miles), and a service ceiling of 9,500 m (31,200 ft). The landing-gear was a tricycle arrangement with steerable nose wheel. Armament included two 20-mm MG 151 cannons, two 30-mm MG 131 nose-mounted cannons, and a MG 131 Schräge Musik cannon firing upward at a 60-degree angle. 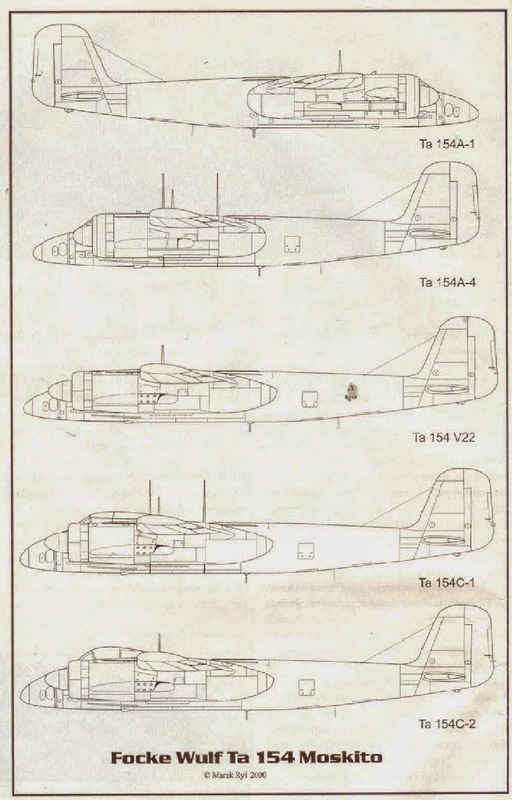 By August 1944, about fifty production versions had been completed, but the aircraft never made it, mostly because a glue of bad quality was used which ate away the wooden parts. 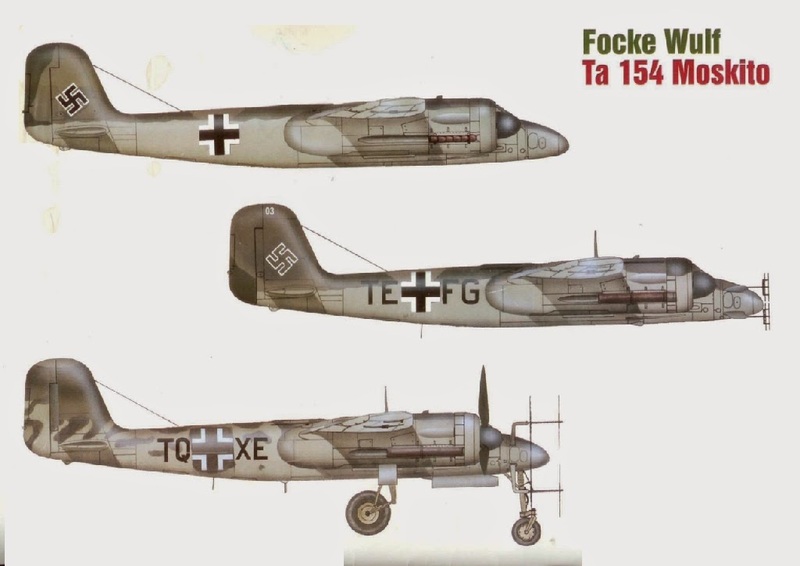 Like the British De Havilland Mosquito, the German Focke-Wulf Ta 154 Moskito was made of wood. This led to some of the production versions breaking up in mid-air, as the glue was incapable of withstanding the stresses produced in flight. The inability to find an adequate adhesive prevented completion of an order for 250 planes. Some of the planes produced served with Nachtjagdgeschwader 3 (Night Fighter Group 3), a few were later used as a training aircraft for jet pilots, and some were modified to form the bottom half of Mistel composite aircraft.